Need to reduce your anxiety? Have a better body-brain connection? If you put your hand on the stove, you feel the heat and take it off. This is an example of your body responding to something happening within or to it. In this case, the activation of heat receptors on your skin of your hand. We then remember that experience and are less likely to put our hand on the stove again. What about the build-up of inflammation or minor internal stresses? How do we monitor those internal functions of our body? They are more obscure to monitor within ourselves so it is more difficult to change the behaviour. By measuring your body functions (such as your heart rate variability, breathing rate or brainwaves), you can see your body moving into unhealthier states and correct this to be healthier again. Over time, like with any training, you will find it easier to be in that healthy state and stay there even when you aren’t even trying. Your body and brain can learn and maintain those healthy changes. Biofeedback is exactly that. Your body and brain learning to be healthier. Feedback is the information on your performance, whether that’s from an examination, work report or in the yoga studio. That feedback is then used to improve your future work. We can do exactly that to your automatic bodily functions such as your heart rate variability or brainwaves. Specialised equipment electronically measures this information. Once it’s measured, specific exercises can be given to voluntarily control that activity. For example, your brainwaves are your brains fingerprint; they are unique in all of us. Some people have too much ‘fast brainwaves’, which may appear as anxiety while others have too much ‘slow activity’ such as those with learning difficulties. These can be trained to normalise their activation. This type of therapy is also called EEG Biofeedback or Neurofeedback. Brainwaves occur at various frequencies or speeds: some are fast, and others are slow. They are given names according to their speed: delta (the slowest), theta, alpha, beta and gamma (the fastest). They are measured in their cycles per second (Hertz, Hz). Delta brainwaves are very slow but big waves seen in deep, restorative sleep. These can also be associated with learning difficulties and daytime drowsiness. 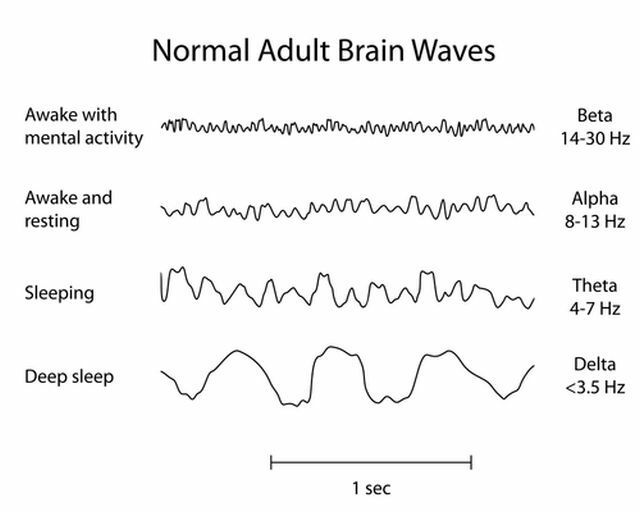 Theta waves occur with daydreaming or the in-between sleep and wake state. It’s seen when the mind goes wandering off and we zone out, losing awareness to the world around us. Too much slow waves can be seen with fibromyalgia, concussions & head injuries, ADHD/ADD, developmental delays, epilepsy, stroke and obsessive-compulsive disorder (OCD). It can result in poor concentration, hyperactivity and impaired memory function. Alpha are distinctive loopy waves. They are the relaxation and disengaged state waiting to respond when required such as when sitting in the classroom listening, but not actively engaging. They come about when you close your eyes and picture a peaceful scene. Too much alpha can result in anxiety and emotional outbursts. Low levels of alpha are seen in alcoholics and those diagnosed with Alzheimer’s. Gamma activity is associated with intensely focused attention and assists the brain in combining information from different parts of the brain. These are generalisations for an educational perspective. Each set of symptoms can have a variety of brainwave patterns. For example, there are at least three different type of brainwave patterns for ADHD / ADD. Importantly, each subtype requires a specific course of therapy. Electrodes are stuck to specific areas on your or your child’s scalp and one or both the ears. The electrodes are merely recording your brainwave activity. Just like putting a stethoscope on your chest to listen to your heart. Then high-technological equipment does complex equations and calculations whilst your practitioner interprets the results. You’ll hear and see instantaneous feedback with how well your brain is training. This instant feedback helps the brain to learn more efficient brainwave patterns. You’ll have little electrodes stuck on your scalp or ears. Electrodes record the brain waves and do not give you any zaps or any other sensation. They will merely sit there whilst your brain does all the work. You may just sit there and relax watching a DVD or play a videogame using your brainwaves to control it. This makes it an easy therapy for both young kids and adults alike. Your practitioner will set goal brainwave patterns to achieve to best help with your symptoms. When you are doing well, you’ll see and hear rewards in the brain game or video you are watching or playing. You won’t receive this feedback when you are not achieving those ideal brainwave patterns. This helps your brain learn and change according to neuroplasticity. You’ll literally be retraining and reconditioning your brain through a process called operant conditioning. Operant conditioning is the fancy neuropsychological term for the brain connecting a reward or punishment to a certain activity to either increase or decrease the likelihood of doing that again. For example, if I try a new brand of chocolate and I don’t like the taste, I’m far less likely to buy it again. The bad taste is the ‘punishment’ in this example. If I buy another dessert and love that, I’m more likely to get that again. That delicious taste is the ‘reward’ so that I’m more likely to take the same action again. How long to the changes last? Initially, these changes will be short lived. With repeated sessions, the changes will gradually become more permanent. Significant improvements are typically seen 75 - 80% of the time. Studies have shown sustained changes a decade after the final training session. That’s a long follow up study in the scientific realm! No. There’s no radiation. Nothing is emitted from the devices. They are just recording. There is no radiation or toxic exposure with the recording or training games. No, it doesn’t hurt. You will sit with a couple of electrodes stuck to your scalp and ears and watch a computer screen or listen to sounds. You may feel a bit spaced out, extra alert or more relaxed after the session depending on what brainwaves are being trained. This will be explained to you prior to your sessions by your practitioner so that you know what to expect. Neurofeedback sessions are used alongside our Neuro-rehabilitation, QEEG Functional Brain Scans, Counselling, Meditation and other services. The heart rate is the number of times your heart beats in a minute. The time between the heart beats can be regular or irregular. A healthy response is to have some variation to be able to ability to adapt to changes (such as stress or pain) and make us more resilient. After undertaking a comprehensive assessment, we are able to determine the most efficient and effective form of training specifically for you. You’ll then perform games and exercises that are specific to you, not to the general population. We couple these precise, individualised games with home advice and exercises to promote long-lasting change. We incorporate heart rate variability and Neurofeedback into our Neuro-Rehabilitation or Brain-Training programs whilst working alongside our dietary, counselling, meditative and yoga nidra services. * indicates that scientific research suggests that it is probably efficacious. Those without asterisk have been scientifically validated.